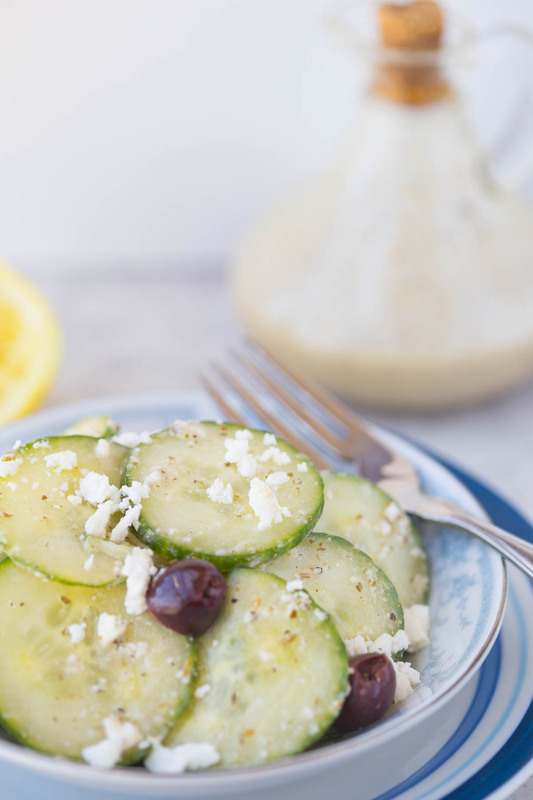 This Cucumber and Feta salad w/ Lemon Greek vinaigrette is bright and vibrant, and will make your taste buds sing! It’s a healthy and delicious snack or grab and go vegetarian lunch, and is an excellent quick and easy summer side dish to whip up for your next church potluck or family picnic. It is that time of year when summer gardens are flourishing, and our crisper drawers are overflowing with produce. Like my cucumbers and vinegar and garden veggie salsa, this cucumber and feta salad with Lemon Greek vinaigrette is a fantastic way to prepare an abundance of vegetables before they waste away in the fridge and, if your family is anything like mine, this recipe won’t even make it to the next day before you have to make another batch. 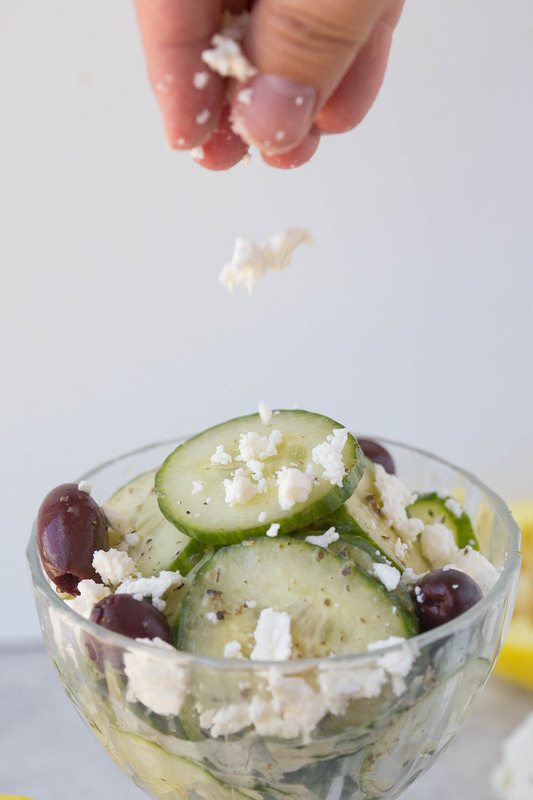 Cucumber feta salad is a comfort food for me in two ways: 1. it is my version of my go-to side dish at my favorite low-key Charleston restaurant B. It’s a dish I can prepare in advance that just gets better over time. It has become increasingly apparent to me that meal planning and prepping is the only way I’m going to achieve my goals. Since weaning Owen my body has been yo-yoing back and forth with the additional 15 lbs I put on when I was pregnant while also toying with the excess weight I had before I even got knocked up. Having simple, fresh and healthy foods like this that I can grab on the go makes eating healthy on a regular basis easy peasy. Right now things aren’t going so great for me. I feel like an old cuckoo clock which still works but goes off at random rather than specific times of day. I’m at a point in my life where I feel like I have absolutely *ZERO* control over ANYTHING that is happening, and if I don’t take the reigns on something then I know for sure I’m going to explode and end up hurting others in the process. So this past week I have decided, rather than cowering in a corridor of depression, I’m going to use my unhappiness and anger to fuel my desire to chase after the success that’s just within my reach. I have started following the Tone It Up nutrition program and, one week in, I can promise you I already know this is a total game changer for me. 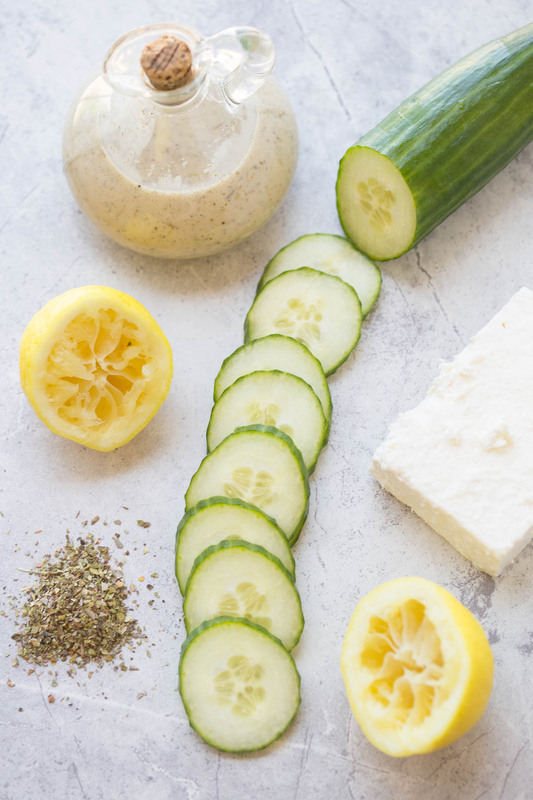 At first glance I realized their guidelines and recipes are cohesive with my palette and passions already and, mixed with their mood boosting workouts, I know this is one plan I can easily follow for the rest of my life. Lawdamercy! Enough whoa-is-me. Let’s eat! 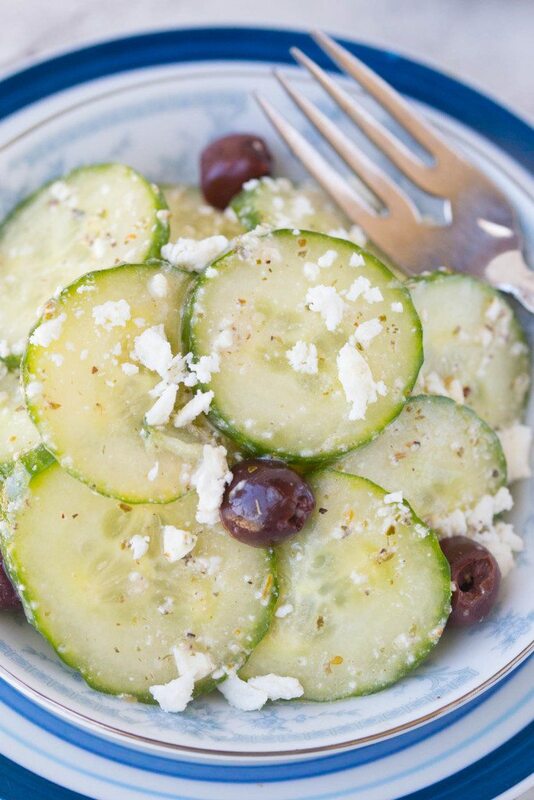 Cucumber Feta Salad w/ Greek Vinaigrette is a light and healthy vegetarian side dish that's a perfect way to clean out the crisper drawer and serve a crowd at your next church potluck or family picnic! 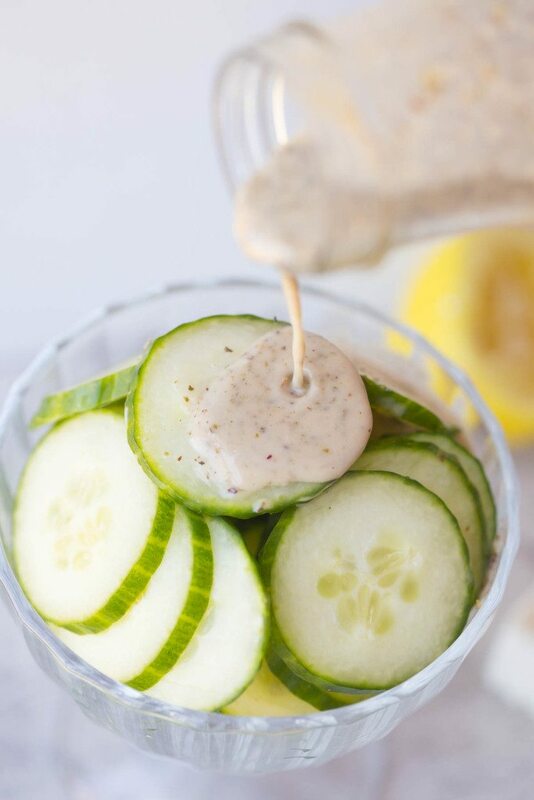 Add cucumbers, olives, & dressing to a large bowl and mix until well combined. Sprinkle with feta cheese and fresh parsley and toss to combine. Refrigerate until ready to serve. NOTE: The longer it sits, the better it gets. Add all ingredients to a small food processor or personal blender and blend until smooth. If you don't have a food processor or blender, whisk all ingredients, except olive oil, together in a small bowl until well combined. While continuing to whisk, slowly drizzle in olive oil until the dressing is smooth and well mixed. For my own future reference (and anyone else who is counting calories) One serving is about 194 calories if you split the entire recipe into 6ths, about 97 calories when split into 12ths. (Since it said 6-12 servings.) Thanks, I can’t wait to try it!